UPTON, NY–This holiday season, scientists at the Center for Functional Nanomaterials (CFN)–a U.S. Department of Energy Office of Science User Facility at Brookhaven National Laboratory–have wrapped a box of a different kind. 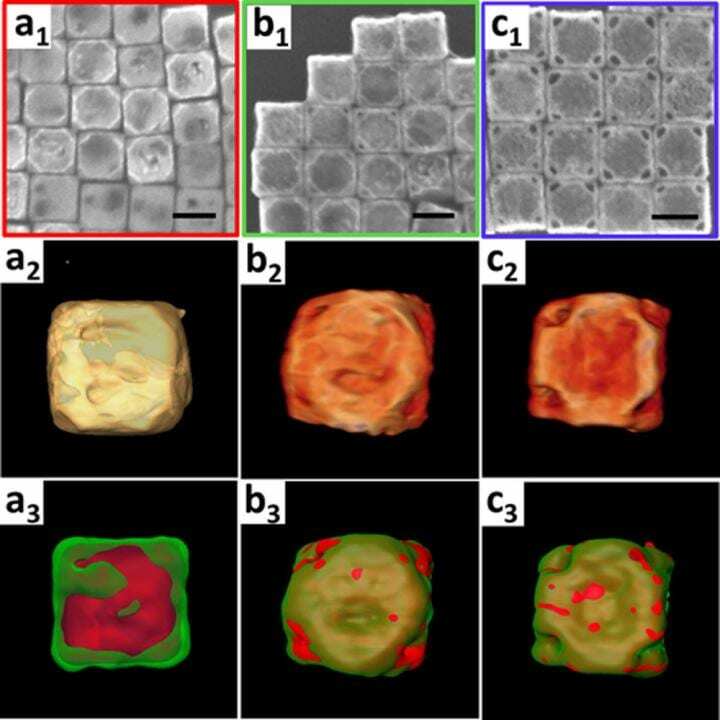 Using a one-step chemical synthesis method, they engineered hollow metallic nanosized boxes with cube-shaped pores at the corners and demonstrated how these “nanowrappers” can be used to carry and release DNA-coated nanoparticles in a controlled way. The research is reported in a paper published on Dec. 12 in ACS Central Science, a journal of the American Chemical Society (ACS). Synthetic strategies have been developed to produce hollow nanostructures with surface pores, but typically the size, shape, and location of these pores cannot be well-controlled. The pores are randomly distributed across the surface, resulting in a Swiss-cheese-like structure. A high level of control over surface openings is needed in order to use nanostructures in practical applications–for example, to load and release nanocargo.